new series we will have a look into the topic IoT from a java developer’s point of view. The world of IoT is growing. More and more java developers start experimenting in it. How can you start? What are the possibilities? We will now approach this topic step by step. To get started I have chosen to work with TinkerForge. For many software developers electronics has always the connotation of soldering iron and much filigrane manual work before they can start with the actual important thing…coding. But there is also some kind of lego-toolkit for the java developer. With this I mean the products of TinkerForge . Here the developer can choose from different elements which can be combined – for example by linking sensors to the MasterBrick. The MasterBrick itself is supplied by power via USB. This way we have already completed our first test arrangement. Estimated time for construction: 3 minutes. Thus we now can directly turn to the software. To be able to use the hardware you have to install two services on your PC. For one thing the service which is responsible for the communication between MasterBrick, sensors and PC. For another thing a viewer which is responsible for the configuration, firmware updates and the like. Additionally the last one can also be used to analyze sensor data. I had no problems with the installation on Windows 8. Estimated time for installation: 5 minutes. This way the setup is finished within 15 minutes and you can get going. In software engineering everyone starts a new topic with a HelloWorld. We will not break with this tradition. To do so we need a MasterBrick with one linked sensor as described above. To keep the example as simple as possible i have decided to use the temperature sensor. So the question is how to do the activation. The arrangement awakes when the connection to the USB port is completed. The MasterBrick shows a blue signal that it is alive. At first we start the service and the viewer (brickv) which we have installed before. Every element owns a UID which we will need later for the communication. To get the UID of the specific element you have to connect your sensor to the viewer which provides the data of the sensor. In my case the sensor has the UID dXj. The source code for this article can be found here (!Link). This repository contains also the language bindings which are needed for the communication with the TinkerForge components. The usage of the temperature sensor can be accomplished in a few steps. For the further processing the last step is the most important. The measured values of the sensor will be processed in the anonymous inner class within the temperature method. Every time a timer interval is passed and the measured value has changed the method is invoked. active the whole night and tranfers measured values in a transient list. The list itself is displayed in a simple JavaFX application. 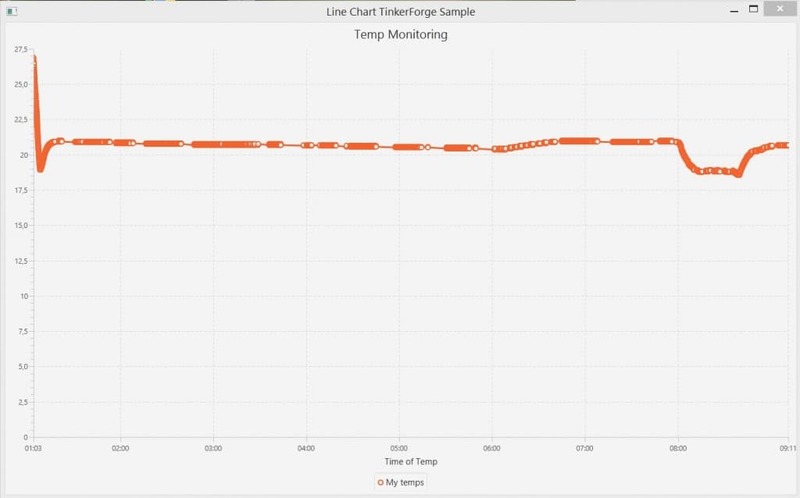 As shown in this simple example we were able to connect to our first sensor and display the measured values. The source code to this article can be found underhttps://bitbucket.org/rapidpm/jaxenter.de-0012-iot-tinkerforge . For people who are interested in more complex examples I recommend the following https://bitbucket.org/rapidpm/modules. why don’t you use the JavaFX Services and Tasks? And why do you create a new Thread and then you perform all of the Thread logic in a Platform.runLater which will be performed in the UI Thread?